Referring to Figure 23.57(a), what is the direction of the current induced in coil 2: (a) If the current in coil 1 increases? (b) If the current in coil 1 decreases? (c) If the current in coil 1 is constant? Explicitly show how you follow the steps in the Problem-Solving Strategy for Lenz's Law. There is no induced current since there's no change in magnetic flux through Coil 2 since the magnetic field produced by the constant current in Coil 1 is constant. This is College Physics Answers with Shaun Dychko In this question, we consider a current in coil one and the effect that current has on an induced current in coil two. So, for part A we'll say that the current in coil one is increasing. And so the question is "what direction will the induced current be in coil two?" 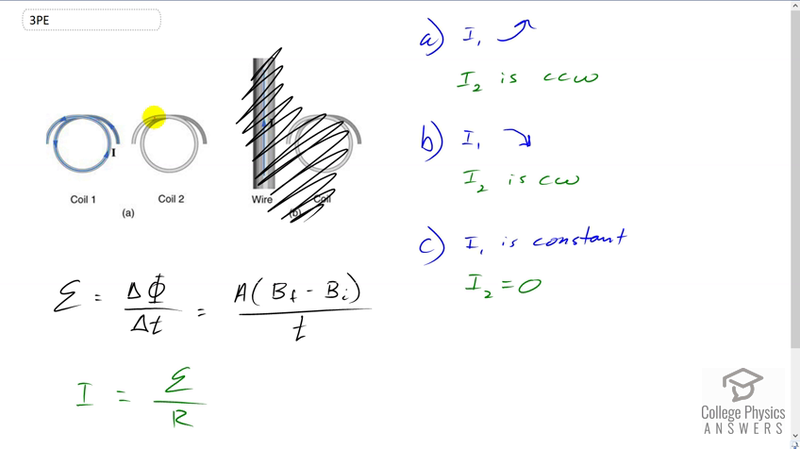 In part B, the current is decreasing in coil one and what effect does that have, and in part C the current in coil one is constant. So, the connection is due to the magnetic field produced by this current. And, the magnetic field when it changes inside coil two, that changing magnetic field will induce an emf, and the amount of emf is the rate of change of the flux, and then that emf will cause a current. Because the current will be the induced emf in coil two divided by whatever resistance this wire has. Now, the area of this coil is staying constant. So, when we're talking about changing flux, really we're just talking about the changing field strength, because the area is not...we're not squishing or elongating the loop. And so this field strength will be changing as a result of a changing current in coil one. So if you consider this portion of wire here and grab it with your right hand, and you have your thumb pointing upwards, you'll have field lines going into the page in coil two. And as current one increases, you're going to get additional field lines going into the page here. And, Lenz's Law says that the current induced in coil two will produce a magnetic field to oppose whatever change is happening. And so the change is that you're getting more field lines into the page, and so the induced current must produce a magnetic field inside the coil that has field lines coming out of the page to oppose this increase inwards due to the increasing current in coil one. So, in order to have field lines coming out of the page here, the induced current, will have to be in this direction. Because if you were to grab coil two with your right hand, and you have your fingers pointing out of the page in the middle of the loop of coil two, you'll find your thumb is pointing upwards on the right hand side, or it's pointing downwards on the left hand side. And so the current has to go in a counter clockwise direction in order to produce a magnetic field inside coming out of the page in order to oppose the increased magnetic field going into the page due to the current of coil one. Okay, so, that answers part A. And then part B, suppose the current in coil one is decreasing. So initially, you're going to have, let's say, four field lines going into the page. And then sometime later, there's only two field lines going into the page, it has decreased. And so, the induced current always opposes the change, and so it will want to create a magnetic field going into the page to replace those that were just lost. Because it does not want any change. Initially there were four, and then, let's say two disappear because there is a decrease of current in coil one. And so, less magnetic field in the presence of coil two. And so, the induced current of coil two will want to oppose that change and replace what was lost. Alright. So in order to get the magnetic field lines into the page here inside the coil, the current will have to go in the clockwise direction. And you can figure that out by grabbing coil two with your right hand and fingers point into the page in the middle of the coil, and your thumb will be pointing to the left on the bottom, or to the right on the top. And so this is clockwise. So I'm drawing what's induced in green, and then what's the magnetic field lines due to coil one in red just to distinguish them. Okay, so counter clockwise is the answer for part B, as shown here. Then, in part C, it tells us that the current in coil one is constant. So there's a magnetic field in the presence of coil two, inside of coil two, due to the current of coil one. But this magnetic field is not changing. And nor is the area of coil changing. In other words, the flux is not changing. And so with no change of flux, this numerator is zero. The magnetic field strength final and the magnetic field strength initial due to the current of coil one is the same. So this difference is zero. There's no induced emf and therefore no induced current. So, the current in coil two is zero when the current in coil one is constant.